The iconic Hepner Hall at San Diego State is one of the original buildings from when the university moved to its current location in 1931. I had a great tour of San Diego State from third-year student Michelle, a kinesiology major from Orange County. Also on my SDSU tour was Anna, a first-year student from Michigan who is a speech and language major, training to be an SDSU tour guide. Both SDSU students seemed like they were hard-working, smart and very much happy with their college choice. Let’s just get the rumor out of the way right off the bat: San Diego State University is a “party school.” At least that’s what they say. However, SDSU is also a well-regarded public university research school. Since 2011, San Diego State has steadily moved up the U.S. News and World Report’s annual ranking of Best Colleges, in both the public and national universities categories. The College of Arts and Letters at SDSU is the largest of the seven colleges, with nearly all students taking at least one course in the school. The college consists of 19 academic departments. SDSU’s College of Sciences is home to San Diego State’s well-regarded researchers, with 8 departments including astronomy, biology, mathematics and more. More than $1.5 billion in grants have been awarded to the university based on the strength of its research. SDSU is the only California university that offers a complete education in Astronomy and the university owns and operates the Mount Laguna Observatory. San Diego State University offers nearly 160 majors and minors in seven academic divisions. SDSU also features the Webers Honors College, with an interdisciplinary curriculum of small discussion seminars for students. The program features 15 units and emphasizes education beyond the classroom with research, study abroad opportunities, service, and more. San Diego State is the only CSU with an astronomy major. Hospitality management graduates from SDSU have an almost 100% job placement rate. Located within a 15-minute drive from downtown San Diego and perched on a mesa overlooking Mission Valley, the SDSU campus is a charming mix of new and old buildings with southwest-style architecture, with multiple campus buildings listed on the National Register of Historic Places. The new student union was the first LEED-Platinum certified student union in the nation. Students at San Diego State are never far from the Pacific Ocean and the mountains. An on-campus bus and a trolley system make it easy to travel through and off the campus. 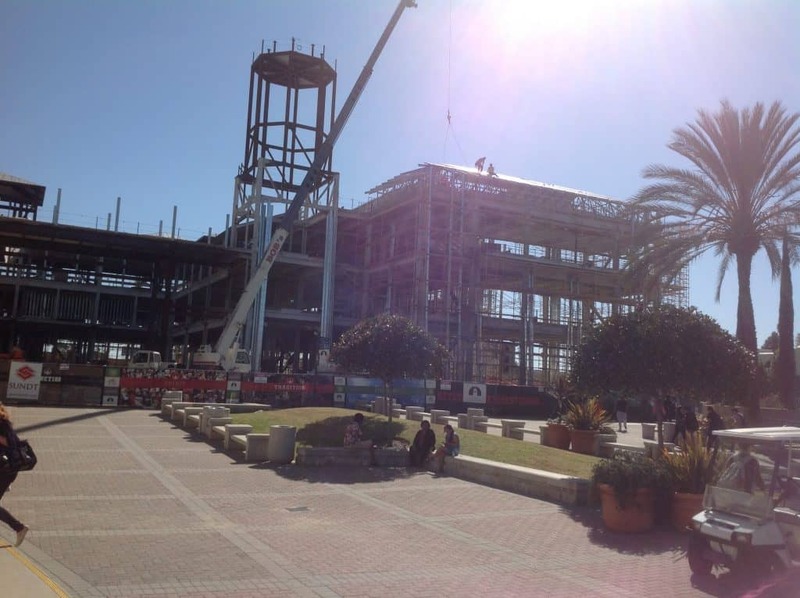 The new Student Union, currently under construction, will be the first LEED-Platinum certified student union in the nation. The symbol of the SDSU campus is Hepner Hall, a Mission style building that houses the School of Social Work, as well as other departments and classrooms. You’ll notice the open-faced bell tower at the top of the hall, and can expect to hear the bells rung once a year at the SDSU commencement ceremonies. The Malcolm A. Love Library is another unique part of the SDSU campus. The six-story building is home to the Infodome, the entrance of the library, nicknamed “the dome” thanks to its unusual dome. That’s not the only thing interesting about the library either — two floors of it are located underground. SDSU’s campus features also include the pedestrian bridge and the Cal Credit Union Open Air Theatre, a 4,600-seat venue. 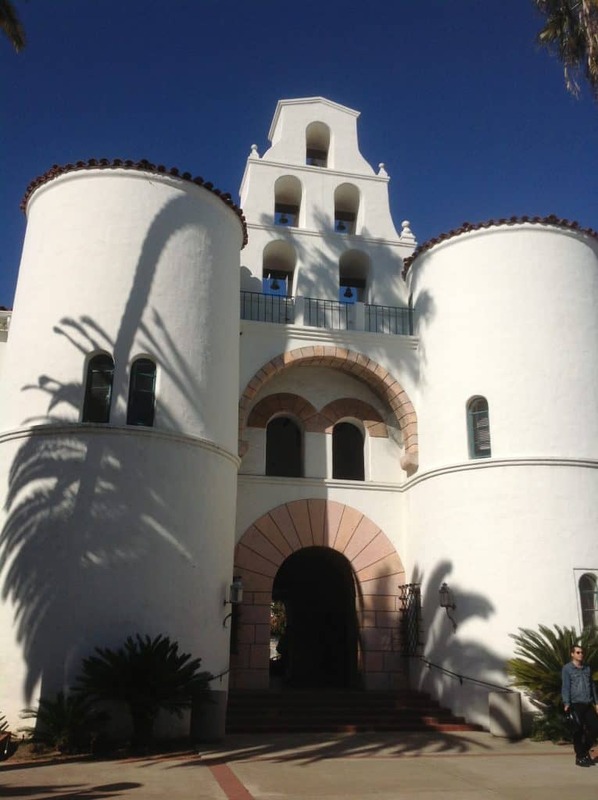 A favorite study spot for students is the Scripps Cottage, the former SDSU library. It’s a small building with an outdoor patio, picnic area and koi pond where you’ll see turtles and fish swimming while students sprawl out over the beautiful landscape. Don’t miss the 100 Years, 100 Stones monument near the Campanile Walkway. The structure was erected to celebrate 100 years of SDSU history in 1997 and features 100 stones all gathered from within 100 miles of the SDSU campus. You’ll see that the center of the floor creates an echo effect — try it out! SDSU students have plenty of options to eat well while on campus, and can grab a meal at five on-campus dining halls, several convenience stores, and 12 eateries. There’s even a bakery, plus a weekly farmer’s market on Thursdays during the fall-spring semesters at SDSU. The San Diego Green Line Trolley is available for students to take to them all of the great spots around San Diego, with a station on campus, and discounted transit passes available. Several shopping districts are a short ride or drive away, with SDSU students are able to visit the College Area, the Mission Valley, and Fashion Valley shopping plazas within minutes. Aside from the typical fast-food restaurants, there are plenty of great local eateries for students to dine at, like Trujillo’s Taco Shop for Mexican and Alfron for Mediterranean. Greek life is big at SDSU, with 16 fraternities and 9 sororities on the San Diego State campus, with about 16% of the SDSU student population as members. However, there’s more than Greek life as far as clubs and organizations, so you can have a rich social life at SDSU! Both tour guides recommended getting involved in one of the 300+ SDSU student groups – this is a great way to make a large school like San Diego State University feel smaller. About 60% of SDSU alumni stay in the San Diego area and are very loyal to their alma mater. “You’re an Aztec for life,” we were told, and alumni networking helps students and recent San Diego State grads. In fact, the university reports that 1 in 7 adults located in San Diego holds a college degree from SDSU, which gives students a great chance to connect for jobs and other educational opportunities. But academic help is available when students need it. Each major at San Diego State has a “major academic plan,” or MAP, a suggested route through the major so that students satisfy all of the requirements. There is dual advising – general academic advising plus faculty advising within each major. There can be benefits to a very large campus. Instead of having to buy new textbooks, which can be very costly, SDSU students have access to nearly 200,000 used textbooks for purchase and rental. There are 600-800 student jobs available each semester with San Diego State’s on-campus food service and the campus bookstore. There is also an EZ books system – students can access a list of the books required for their classes online, check which ones they want to buy (new or used), and the SDSU bookstore will pull them all and have them waiting in a box for pickup. The SDSU mascot is the Aztec Warrior, introduced in 2003, and was voted as NCAA.com’s Best Live Person mascot. The serious-faced mascot is a staple at all SDSU athletic events. College spirit is at an all-time high during events like Aztec Nights, on-campus parties and events that are free for students. The after-dark events are entertainment activities where students can socialize and have fun while remaining on campus. Activities include carnivals and comedy showcases. After they arrive for their first semester, SDSU students will receive a crash-course in Aztec tradition at Templo del Sol, where they learn the San Diego State fight song, meet new students and do get-to-know-you activities with fellow Aztecs. During finals week, students can ease their stress with the Midnight Study Break with free breakfast, study help, and raffles. Make no mistake: it would be easy to have quite the fun college experience at San Diego State. When they took us through the SDSU athletic complex and told us that five thousand students attend pretty much every basketball game, Michelle referred to the facilities as “The Madhouse on the Mesa.” We frequently ask high school students if they envision themselves painting their face red and black to watch a football or basketball game; San Diego State is one of those schools where students do this! San Diego State is rated as more selective by both the Princeton Review and U.S. News than most universities. The school admits 37 in every 100 students and receives around 59,000 applications. The overall GPA average for their students is a 3.69 (weighted). SDSU ranks applicants within each major, not overall. The best way a prospective student can get into SDSU is to have a strong academic record. San Diego State uses the California State University application, available through the CSUMentor website. Is SDSU Right for Me? 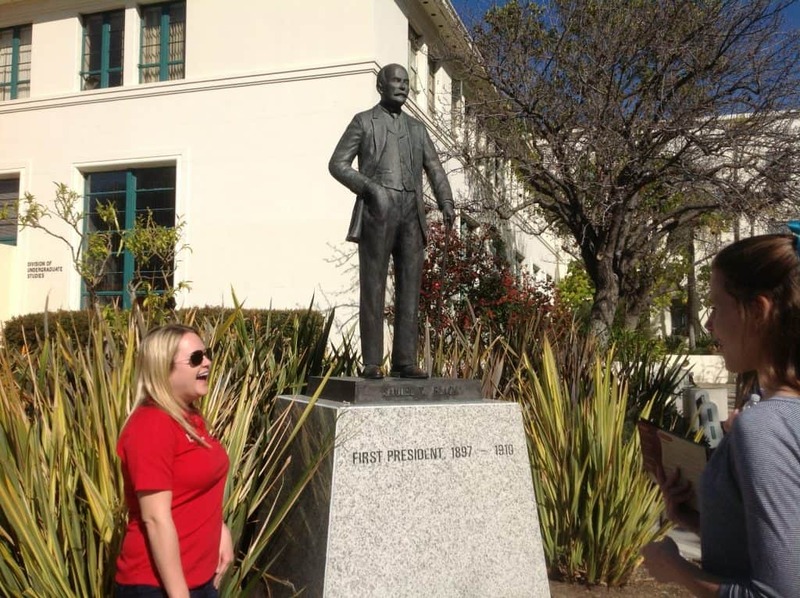 Tour guide Michelle, talking about SDSU’s first president (rub his bronze shoes for luck on tests!). Reputations and rumors aside, I enjoyed my visit to San Diego State University and got the feeling that students who can focus on academics, even if they are also focused on having a good time, can succeed and enjoy their time here. The numbers are edging up; SDSU’s six-year graduation rate is about 66%; this is a bit higher than the national average and far above the CSU systemwide average. Some additional fast facts about San Diego State are here; here is the album with the rest of the photos from our visit. Several SDSU tours are available for prospective students, both on campus and virtually.